Eros Craters - Solar System Planets And Moons Section. 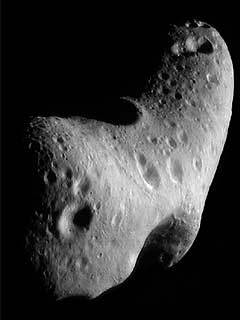 asteroid Eros Image credit: NASA/JPL. University of Arizona scientists have discovered why Eros, the largest near-Earth asteroid, has so few small craters. When the Near Earth asteroid Rendezvous (NEAR) mission orbited Eros from February 2000 to February 2001, it revealed an asteroid covered with regolith - a loose layer of rocks, gravel and dust - and embedded with numerous large boulders. The spacecraft also found places where the regolith apparently had slumped, or flowed downhill, exposing fresh surface underneath. But what NEAR didn't find were the many small craters that scientists expected would pock Eros' landscape. "Either the craters were being erased by something or there are fewer small asteroids than we thought," James E. Richardson Jr. of UA's planetary sciences department said. Richardson concludes from modeling studies that seismic shaking has obliterated about 90 percent of the asteroid's small impact craters, those less than 100 meters in diameter, or roughly the length of a football field. The seismic vibrations result when Eros collides with space debris. Richardson, Regents' Professor H. Jay Melosh and Professor Richard Greenberg, all with UA's Lunar and Planetary Laboratory, report the analysis in the Nov. 26 issue of Science. "Eros is only about the size of Lake Tahoe - 20 miles (33 kilometers) long by 8 miles (13 kilometers) wide," Richardson said. "So it has a very small volume and a very low gravity. When a one-to-two-meter or larger object hits Eros, the impact will set off global seismic vibrations. Our analysis shows how these vibrations easily destabilize regolith overlaying the surface." A rock-and-dust layer creeps, rather than crashes, down shaking slopes because of Eros' weak gravity. The regolith not only slides down horizontally, but also is launched ballistically from the surface and 'hops' downslope. Very slowly, over time, impact craters fill up and disappear, Richardson said. If Eros were still in the main asteroid belt between Mars and Jupiter, a 200-meter crater would fill in about 30 million years. Because Eros is now outside the asteroid belt, that process takes a thousand times longer, he added. Richardson's research results match the NEAR spacecraft evidence. Instead of the expected 400 craters as small as 20 meters (about 70 feet) per square kilometer (three-fifths mile) on Eros' surface, there are on average only about 40 such craters. The modeling analysis also validates what scientists suspect of Eros' internal structure. "The NEAR mission showed Eros to most likely be a fractured monolith, a body that used to be one competent piece of material," Richardson said. "But Eros has been fractured throughout by large impacts and is held together primarily by gravity. The evidence is seen in a series of grooves and ridges that run across the asteroid's surface both globally and regionally." Large impacts fracture Eros to its core, but many smaller impacts fracture only the upper surface. This gradient of big fractures deep inside and numerous small fractures near the surface is analogous to fractures in the upper lunar crust, Richardson said. "And we understand the lunar crust - we've been there. We've put seismometers on the moon. We understand how seismic energy propagates through this kind of structure." The UA scientists' analysis of how impact-induced seismic shaking has modified Eros' surface has a couple of other important implications. "If we eventually do send spacecraft to mine resources among the near-Earth asteroids or to deflect an asteroid from a potential collision with the Earth, knowing internal asteroid structure will help address some of the strategies we'll need to use. In the nearer future, sample return missions will encounter successively less porous, more cohesive regolith as they dig farther down into asteroids like Eros, which has been compacted by seismic shaking," Richardson noted. "And it also tells us about the small asteroid environment that we'll encounter when we do send a spacecraft out into the main asteroid belt, where Eros spent most of its lifetime. We know the small asteroids - those between the size of a beachball and a football stadium - are out there. It's just that their 'signature' on asteroids such as Eros is being erased," Richardson said. This finding is important because the cratering record on large asteroids provides direct evidence for the size and population of small main-belt asteroids. Earth-based telescopic surveys have catalogued few main-belt asteroids that small. So scientists have to base population estimates for these objects primarily on visible cratering records and asteroid collisional history modeling, Richardson said.